If you think about all the dentist’s and doctors’ offices, clinics, mortgage companies, tire shops, and every other profession that uses monochrome laser printers, surely the count is in the hundreds of thousands, perhaps even the millions, thinking globally. 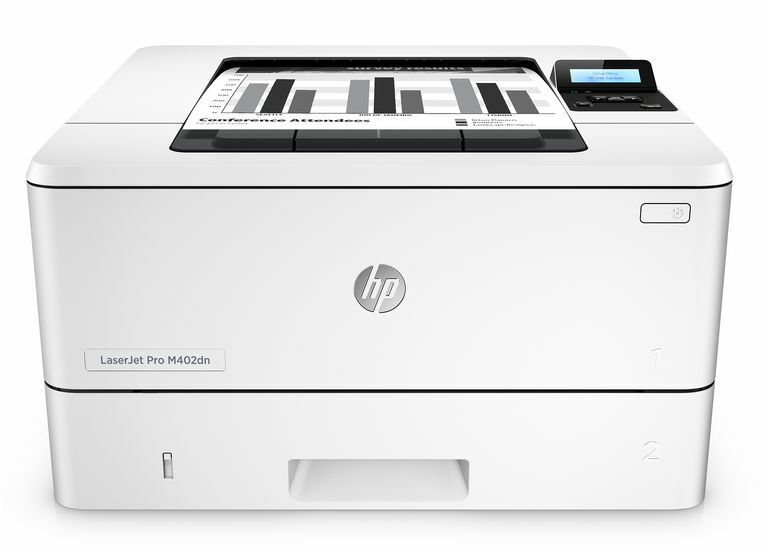 Enter HP’s LaserJet Pro M402dw; on top of being fast and printing exceptionally well, it’s relatively small and easy to use, and, similar to the Color LaserJet Pro M477fdw, it supports HP’s fairly new JetIntelligence. At 15 inches wide by 25 inches from front to back, and 9.5 inches high, this little laser printer takes up very little space, and it behaves well, with little-to-no rocking or vibrating. Unlike many machines in this price range, which are often driven by LED array technology, this LaserJet is actually laser-based. Whether the print engine was one or the other wouldn’t matter, except that in this case, it’s part of HP’s JetIntelligence, which reportedly increases both speed and print quality. Since the LaserJet Pro M402dw is single-function; all it can do is print. No scanning, no copying, no faxing, and no printing labels on optical discs. You do get support for Apple’s AirPrint, HP’s Wireless Direct, the company’s equivalent to Wi-Fi Direct, Google Cloud Print, Mopria-certified, and a few other mobile connectivity options. HP claims to print up to 40 pages per minute (ppm), an impressive speed if you truly need it. This model churned out better-than-expected documents and graphics, keeping in mind that it's not really designed to print colored bar charts full-color photos. When it comes to black-and-white or grayscale prints, though, we liked everything we saw. Paper handling consists of a 100-sheet override tray, as well as a paper cassette capable of holding 1,250 sheets, for a total of 1,350 input pages from two sources—decent variety, but you can add a third 550-sheet cassette for an additional $140. This printer has an 80,000-page maximum monthly duty cycle, which is the number of prints Canon says you can print on this machine each month without undue wear and tear to the printer. If you purchase the company’s 9,000-page yield toner cartridge, your cost per page will come out to exactly 2 cents per page. We searched the Internet for discounts, but every vendor we looked at sold the 9,000-yield cartridge for the exact amount as Canon, $196.99, or higher. So until the toner starts coming down, you’ll have to settle for 2 cents CPP.